Packing for a trip is exciting but also can be slightly confusing. You can see on the left what it looks like when I start to pack. 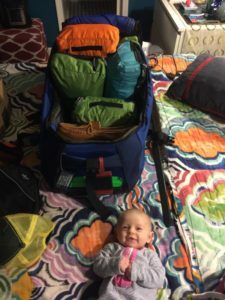 I have compiled a list of my top items I always tell travelers to pack with a brief description on why I like the items. There might be some specific items for specific trips but the items listed below would be a great addition to any trip you go on. Click on the picture or link to bring you to the Amazon page for the product. 4 TSA Approved 3oz Containers: Most people will need at least 4 containers for: shampoo, face/body wash, hand sanitizer, and sunscreen. Obviously if you need more than four, bring as many as you need but keep in mind they must all fit in a quart sized bag. You can probably get these cheaper locally at a drugstore or a discount retailer than Amazon and there is nothing special about the product I am linking but I will link it for convenience. Click here for Amazon link. Neck Pillow: Everyone should have something like a neck pillow. Your own preference may vary but I love ones that are soft and are made of memory foam. Click here for Amazon link. Money Belt or Necklace: I prefer the one around my neck, but many people prefer one that goes around the waist. A matter of personal preference. Click here for Amazon link. Fast Drying, Sunblock Clothing: The most essential piece of clothing, other than socks, would be a light, breathable, fast drying layer you can wear by itself or under a jacket. If we are in a tropical area or somewhere really hot (Europe in the summer), fast drying and breathable means you will feel better as you walk through the city. I personally own a few of these and generally like products made by the Colombia company. The one listed is SPF50 which helps a bit. Click here for Amazon link. Portable Hair Dryer: This compact hair dryer will detect foreign voltage and adjusts travel hair dryer automatically. Click here for Amazon Link. Portable Straightening Iron: This portable straightening iron is dual voltage for worldwide use.Click here for Amazon Link. Portable Portable Curling Iron: This portable curling iron is also dual voltage and is suitable for usage while traveling.Click here for Amazon Link. Carry On Luggage – Entry Level: If you want great value for a carry on, American Tourister (which is owned by Samsonite) has 3-pack of carry on luggage for less than $150 which is a great deal. I prefer soft shelled luggage for two main reasons: you can stuff more in them and you can sit on them when you are waiting at an airport or train station. Click here for Amazon link. Carry On Luggage – Premium: A strong, soft-shelled carry on is a great investment. I travel extensively and put all my luggage through all sorts of stress so I would definitely recommend investing in sturdy luggage. Although the price tag is around $500 for one, this one is extremely well built but more importantly has a lifetime warranty that even covers airline damage. Briggs & Reily are usually somewhere near the top when it comes to ratings of brands used by people who spend many days on planes and in airports. Click here for Amazon link. Portable Battery Backup: It is incredibly annoying when your phone or e-reader dies. If you bring a backup, you can prevent this. Anker is a great brand that is well tested. This one is extremely lightweight but comes with two USB slots so you can charge two devices at once. This charges a very low iPhone to full in about 2 hours. Click here for Amazon link. Waterproof Point and Shoot Camera: If you are a photographer, you won’t need any of my advice on what system and lenses to bring. If you just want one that works on the trip, I recommend something that is sturdy, waterproof, and easy to use. Waterproof makes shooting in the rain less stressful and point and shoot cameras make capturing spontaneous moments much easier. The one I linked is the one I have. Click here for Amazon link. GoPro Camera: If you want to take some action videos, I would recommend a GoPro. This is amazing for ziplining or whitewater rafting; basically this is perfect for adventure videos. The one I linked is the one I have. Click here for Amazon link. Premium Binoculars: These are perfect for viewing wildlife anywhere in the world. Get upclose views of elephants on a safari, whales in the ocean, or anything you could ever want to see. The Nikon 7576 MONARCH 5 is probably the best premium binoculars that have many of the features of binoculars priced much more ($1000+) without costing as much. Water-proof, fog-proof, with Nikon’s ED glass make it pretty competitive to the more expensive models. Click Here For Amazon Link. Small Day Pack: Osprey makes great packs and this is a nice light one that can be convenient for a water bottle, small first aid kit and snacks for the day. Please note that backpacks are not allowed in the Vatican or at a few of the other museums. Click here for Amazon link. Sunscreen Wipes: Whether you are on the slopes, gold course, or at the beach, you will need sunscreen. I prefer the wipes because they do not spill in your bag and are easier to apply with less mess. Perfect when you have a baby. The one listed is the best value and 50 wipes should be enough for a family of four during a normal length vacation. Click for here Amazon link. Insect Repellent Wipes: Sometimes insects will “bug” you but there are easy ways to deal with them. I will always recommend the wipes over anything else due to the fact they are more convenient to pack and apply. The brand I like is Ben’s and since they don’t take too much space, you can pack more than you need. Click here for Amazon link. First Aid Kit: If you are on a cruise or tour, they will have robust first aid kit handy. While you are on shore or maybe on an excursion, having one is always handy. The one linked is very basic but you can fit it to your needs. Click here for Amazon link. Filtered Water Bottle: Having a waterbottle is always useful. I recommend LifeStraw as the filter and they make a water bottle that fits their filter. Click here for Amazon link.